Home » Keeping Chickens » Keeping Chickens FAQ » Why Have My Hens Stopped Laying? There can be several reasons why chickens have stopped laying but with a little bit of detective work, you can normally work out why your birds aren’t laying. Generally speaking, all chickens will stop laying when they go through a moult as the protein that was being used to produce eggs is diverted to feather production. This is usually in late summer / autumn although pullets and cockerels (chickens under one year old) will not normally moult in their first year. Moult – Feathers are 80% protein so during feather growth, protein is diverted from egg production. Insufficient light – Chickens ideally need 14-16 hours per day. Typically hens stop laying between late September and February in the UK. Incorrect diet – Fat hens don’t lay eggs! Feeding too much mixed corn for example will cause excess weight and provide insufficient protein. There is more detailed information about Feeding Chickens here. Age – Hens lay less as they get older. Health – Poor general health can stop them laying. Red Mite in the coop feeding from them at night is a common cause of anaemia in hens. Disease – underlying disease can affect the quality of eggs as well as laying ability. Red Mite – During the summer months, these are a common problem inside poultry houses and will cause egg numbers to drop or hens to stop laying. See my Ultimate Guide to Red Mite for further information. Stress – Moving hens, a water shortage or a scare from a predator are common causes of stress. 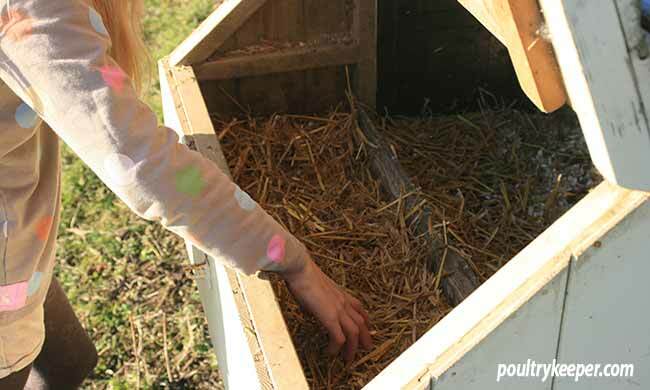 Broodiness – Hens will sit on a nest and will stop laying for 5 to 10 weeks. Feathers are mainly protein so when chickens moult, replacing their feathers, they will usually stop producing eggs because their body cannot supply enough protein to produce new feathers and eggs. You can read more about chickens moulting here. A reduction in daylight hours causes hens to stop laying. Chickens need 14-16 hours of daylight per day in order to lay and over the winter months they will usually stop laying. In the U.K. they normally stop from November to February. Hens are sensitive not only to the amount of daylight hours but also whether the this is increasing or decreasing. Hormones in the body, produced by the pituitary gland at the back of the eye regulate egg production so when daylight hours are decreasing, egg production decreases and eventually stops. Laying can continue through the use of artificial lighting to extend the natural daylight hours and commercial farms will use artificial lighting in order to produce eggs during the winter as well as summer months. It is necessary to provide a balanced diet to maintain egg production. Between 2 and 4g of calcium is required to produce an egg-shell. Calcium is stored in the skeleton (which contains between 20 and 40g depending on the breed) but this is rapidly depleted during egg production. Eggs are made up of around 80% protein, so naturally, they must also have sufficient protein in their diet in order to produce this. Amino acids, vitamins and minerals are the building blocks of protein. To maintain egg production, you should feed a suitable balanced layers feed that will contain sufficient protein and calcium. Oyster shell grit can also be provided ad-lib to ensure a hen is able to eat according to her individual needs. You can read about the types of poultry grit here. 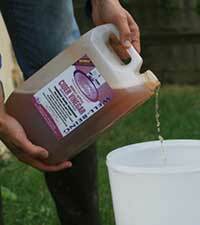 There is much more information on our feeding chickens FAQ page about feeding chickens correctly. Apple Cider Vinegar (or ACV for short) is full of vitamins, minerals and trace elements. It has numerous health benefits to support the immune system and is particularly good at times of stress when chickens can pick up disease. If my hens have stopped laying then I ensure they get ACV at least 1 week in 4. Click here to view our page on ACV to learn more. Of the other factors that can stop a hen from laying, the most common are broodiness (you can read how to stop a hen from being broody here), stress (for example when moved to a new environment, scared by predators or through lack of water), lice and even severe weather conditions. A good starting point is to know how many eggs you can expect from your breed of chicken and more importantly the particular strain of bird you have. Generally, birds that have been highly bred for showing lay fewer eggs as they have been selected for looks rather than egg numbers.